Last weekend, Wilson and Lucarelli premiered their feature film, Disrupt/Dismantle, at Colorado’s Vail Film Festival to enthusiastic audiences. The film focuses on the Los Angeles Police Department’s elite undercover narcotics division, and the challenges its officers face trying to take down a powerful drug cartel while balancing their commitment to family. Wilson is associate producer and fills the role of Detective Stern, while the film is co-produced, co-directed and co-written by Lucarelli and his partner, Troy Price, and stars Lucarelli. „By the time many babies are barely mastering walking, Jeannie Wilson was taking dance lessons. In elementary school, she was training in tumbling and acrobatics, taking piano lessons and still dancing. During her junior year in high school, she became a runway and catalogue model. Other TV roles have included Full House, Maude, JAG and Still the Beaver. The busy actress also appeared in Murder, She Wrote, Love Boat, Dukes of Hazzard, Fantasy Island, The Bionic Woman and many others. The talented singer was the opening act for Buddy Hackett in Las Vegas. I’m a big fan of the80s tv shows n have been collecting the dvds for a few years now . considering what us baby boomers have to watch I find myself loading up my dvd player as I am right now with season 1 of the simons and everytime I see Jeannie Wilson it makes me smile and happy to know shes still doing well. one of the most beautiful women o tv from the 80s n still is . I really miss those days but the great thing is wen tv is at its worst I can always pop in a simon episode magnum the fall guy hunter or MacGyver n Rockford because ive got all of them . Jeannie Wilson if you see this my son n I love you n hope to see you do more real soon. 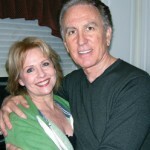 Hi Jeannie, Clyde Combs talked me into doing a dance class with you and Cathy Brodrick at SFA. It almost killed me trying to keep up with you guys, but I did enjoy it. Lived in Vail for a while, and noticed you presented a new show there recently. Live in Houston, married and had three kids. Was a real estate developer for years and retired I am writing novels. Did a few screen plays in Hollywood during the seventies, worked Vegas also. Hope you are still shaking a foot, you were always a dream to watch.